Johann is the implantologist at Portmore, and he’s also a partner, responsible for helping to run the business and make life better for everyone involved. He qualified in June 1987 at the University of Pretoria in South Africa. He relocated to the UK in 2001 and joined Portmore in 2002. He received a degree in Implantology at Lille University in France and was honoured at the American Academy of Implant Dentistry, where he became an Associate Fellow. Johann reached Master’s level at the New York based Rosenthal Institute of Aesthetic Dentistry in 2005 before becoming a UK instructor. With more than 15 years experience in cosmetic dentistry, Johann is an established authority in quality aesthetics. 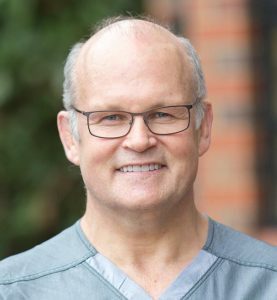 Johann believes in the Portmore ethos of listening carefully to his patients in order to treat the whole person and take a whole mouth approach to dental care. He then tailors treatments from his extensive knowledge of implants, smile makeovers, crowns, bridges, and cosmetic dentures to create beautiful, life-changing smiles. This advanced work has changed the lives of many patients at Portmore by rebuilding their mouths after significant tooth loss with treatments such as the All On 4 system or by securing dentures with implants. Johann says the most rewarding part of his job is the moment of finishing treatment and seeing his patient realise it was all worth it. If he wasn’t a dentist he feels he’d be helping people some other way.